I have seen a lot of digital work before but this is really very perfected and the ultimate beautiful.I like the hint of the red heart Will you be doing anymore black and white work? such an amazeing Pic! congrats! "She isn't real, I can't make her real"
There's something in her eyes that trapped me since I found this picture. Oh, "I will try to find my place in the diary of Jane..."
the eyes are so cool! feels like they are staring deeply into your soul! It is my pleasure to feature this amazing artwork in my journal 'New Features for April - May' [link] If you wish it to be removed, please note me and I shall do so. omg i love this so much!!! >.< The position of her hand is so pretty! The spider on her hand looks so happy! 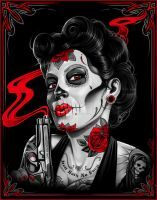 this is brilliant, it would make an awesome tattoo, ....(dont suppose you would give permission for use as my next tat?) i love it! This reminds me of something you might see in a Dark Alice in Wonderland type movie. Oh my GOD, that is AMAZING! ooh,my heart just skipped a beat!! Lovely to see someone with a limited palette,I'm in love with the look myself,& you do it SO well!! This red heart makes all picture so beautiful! I love that violin-shape effect on her corselet! It's so stunning hunney!!! Do you give permission to tube this image please? Thanks in advance!!! Such a nicely done posture of the hand.